This high quality designer dress by Minuet is classy and sophisticated—the perfect dress to wear in the boardroom or to any networking function where you want to look tasteful and chic. It is fully lined and features a unique twist detail at the neckline that continues down the front of the dress, forming a ruffle on the skirt. The banded waist and capsleeves create a figure-flattering look, and an invisible back zipper completes this dress. The Capsleeve Twist Designer Dress by Minuet comes in two great color options and would look good paired with pumps. Also available in Navy. Details: Fully lined. Invisible back zipper. Lined and lightly padded bust for support. 95% polyester, 5% spandex. Lining: 100% polyester. Dry clean only. Small measurements: Length from top of shoulder to hemline: 33”. Bust: 32-34”. You have added Capsleeve Twist Designer Dress by Minuet in Cream into Wishlist. You have added Capsleeve Twist Designer Dress by Minuet in Cream for Stock Notification. 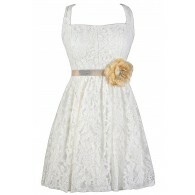 You have set Capsleeve Twist Designer Dress by Minuet in Cream as a loved product. 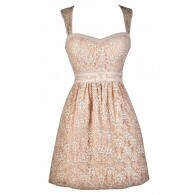 You have removed Capsleeve Twist Designer Dress by Minuet in Cream as a loved product.